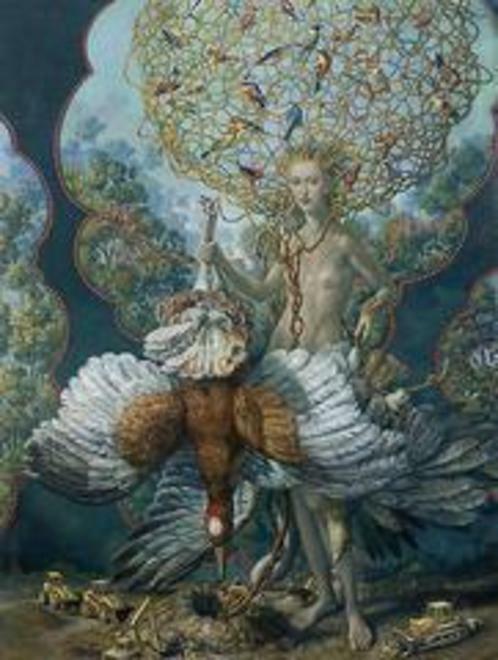 Julie Heffernan, to swipe a line from Walt Whitman, is large; she contains multitudes. Her art blossoms and bursts forth across the canvas like a garden seen through the miracle of time-lapse photography, overgrowing into gross and beautiful decadence before you, its fruits ripening and sagging on the vine. Bouquets of flowers are popping up over here, over there tangled and thorny roots are worming their way out of the soft earth. But along with all of that flora, strange fauna is also crawling up from the green slime - flocks of birds, soft little deer, even miniature buildings are bubbling up from the muck. And standing in the middle of it all, like some fertility goddess of ancient legend, you invariably find Heffernan herself, clad in fancy gowns made from tap roots or writhing animals and looking out at you with an expression of absolute, eerie inscrutabiltiy. Heffernan paints like an old master, like nobody has really bothered to paint since before the Impressionists. But unlike the artists of old, Heffernan doesn't fill her large canvases with old fables, scenes from the bible, portraits of wealthy patrons or prettified war stories. She lavishes her attentions on herself, and fortunately that self has proven to be a rewarding and fascinatingly complex subject. Heffernan creates an alternate universe in each canvas.